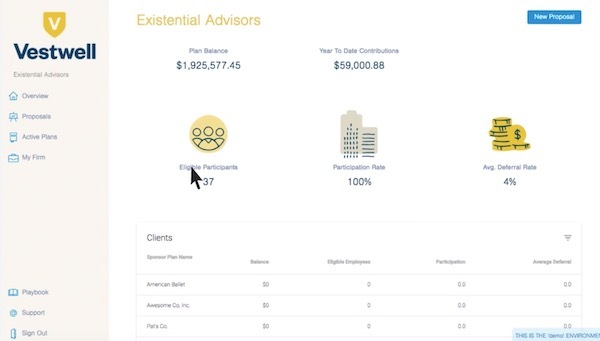 Vestwell is considered the first digital retirement platform built for the financial advisor. And it helps scale plan sponsor and participant relationships to a new level. Through its streamlined administration, fiduciary oversight, and modern interface, Vestwell has improved on the 401(k) and 403(b) industry for the better. Over the last year, Vestwell’s client growth increased tenfold and the company signed strategic alliances with BNY Mellon, Allianz, Namely, Dimensional Fund Advisors, OnPay, Riskalyze, and several others. This funding round is expected to propel Vestwell even further and reset the bar for how open-architecture in retirement plans can be provided to companies of any size in an affordable and modern way. And this includes significant investments in technology and client service — which are two areas where Vestwell continues to innovate. “We were drawn to Vestwell because it has developed a modern and intuitive interface that empowers advisors to more efficiently manage customized retirement plans,” explained Goldman Sachs’ CIMD co-heads Timothy J. O’Neill and Eric S. Lane.